Lil update, we had our best week last week. We sold 70 racks, and a bunch of chicken in 3 hours. Made some decent money, so was able to make up for the couple of crap night we have had. Last week we sold 70 racks and even more chicken (22lbs), this time we sold out in 2 & 1/2 hours. I'm at the limit of what the pit will hold. When I originally built it I was not thinking ribs, that being the case I think I can adjust the shelves and gain space for another dozen racks per cook which equates to being able to vend 90 racks. I'm also moving to modular vending which although is not as authentic allows scale - people down here dont know the difference anyway. Just sorting out the key piece of equipment - blast chiller, and they are not cheap. Congrats on this thing taking off!! I personally dont think a "blast chiller" is really needed for ribs, they arent all that thick so a standard commercial fridge with fan should do the job IMHO [ my prep cooler does ]. Heck, I can make ice in the darn thing if I set it low enough...I have out of coleslaw...Ooops! You can use a regular freezer if you don't over fill, and use some extra air circulation. Takes some experimenting. Also be careful about using a chilling unit for other storage, as the temp inside can vary quite a bit from start to finish, and could effect other products you may want to store in the same unit. Easy to test by measuring internal temp and a timer to see how long it takes to get to the temp you want. Most important is keep that air moving over the entire surface of the product if possible, use screen or mesh type shelves to let air flow get to bottom sides. Best way is side fans blowing across the surfaces, and do not package the items, leave them unwrapped. Thanks for the suggestions guys. I really appreciate it. I m looking at cooling up to 54 full racks of ribs per lot and doing up to 3 lots in a 10 hour cook. This is too many for my refrigerator to handle anything close to this. The good new is I have found a suitable blast chiller. It will take 54 racks at once and can cool them in < 2 hours as a bulk lot. It is pricy, but within my budget. Just a quick question, what type of slicer are you using to cut your cabbage for slaw? I saw on BBQ with franklin a simple meat slicer looking thing which you just push the cabbage using a cradle into a static blade. I like my slaw cut real long and thin so one of those power blender/chopper things is not for me. Just gave notice with my current employment. In 4 weeks I am officially in the BBQ business. Just wanted to post up a pic of the first of my modular vending carts. 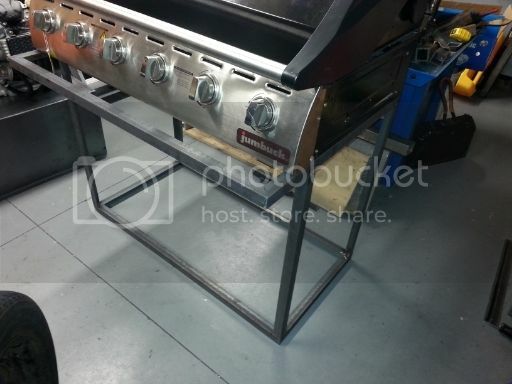 As you can see this is the grill cart that will be used to re-heat ribs which is a big seller for us. Its made of 30x30x3mm mild angle. Obviously not finished yet but any progress is good progress. Once the floor and flanges for the wheels and gas bottle retainers have been fitted it will be hot dip galvanized. The idea being that after a busy vend the whole thing can just be washed down at a self service car wash.
Once the frame comes back the sides will be fitted with stainless as well as a door and hinges. Congratulations!!!!! I wish you the best in the subsequent years. There is no doubt you'll do very well. I got my blast chiller delivered and installed and working. I did my first lot on sat. I have added 2 extra shelves to my pit, which takes me up to about 13 square feet of cooking space. This allows me to cook 54 full racks in one go, with space for some butts or beef. Cooker cant notice the difference with the extra 20 racks, just need a couple of extra splits when I stoke her up. I cook The ribs for about 2-3 hours uncovered 250-300F. Then foil and into the cook in hold for another 2-3 hours 225F. Then straight into the blast chiller for 1-2 hours. Then into the holding fridge. To reheat I just throw them on the gas grill 4-5 each side, sauce and serve. If i do one long day of cooking I can do 216 racks and 20ish butts. I can then vend for 3 days to get rid of it all. If I can sell 4-6k a week worth of Q etc I'm solid. I have 3 events per week booked already and then I will roadside vend to move any unsold product. I'm also coming over to South Carolina next month to check out some of the setup you all are using. Just got done with preping, cooking and chilling 146 full racks. Things going well. Rep starting to build rep at 2 other events. Did a cook for a customer on Sat. 4 buts, 7 bolars. 100 chicken drums. Cooked it all in 6 hours. Made $450 to pay myself! Made another $350 vending that night!. Not bad. If only that was a daily thing. Keep going, it will come a little at a time. This week has been real good. Our rep is strating to build. Thurs (our 3rd time) we had a 64% increase in sales. Fri (our 4th time) we had a 70% increase in sales. I am very happy with how things are going - esp. considering this is our 4th week of vending full time. I made enough to pay myself a few hundred - which was unexpected i.e. we are now ahead of my curve in terms of sales.